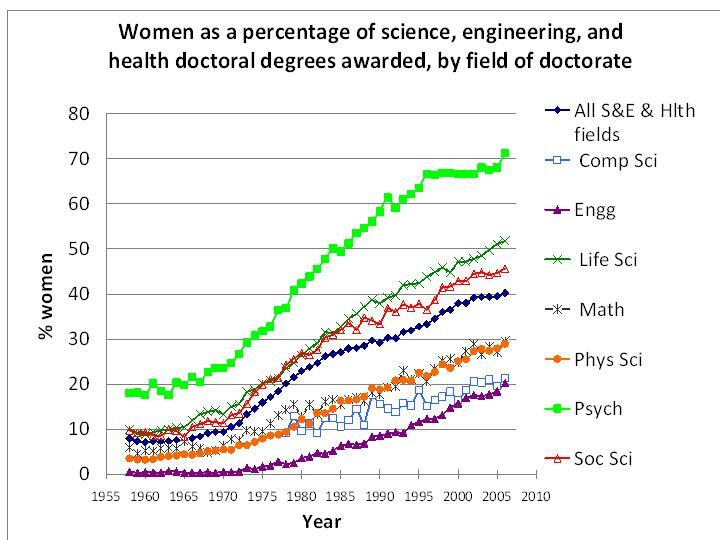 Data from the National Science Foundation link shows the increasing percentage of women among Ph.D.s awarded in various fields. 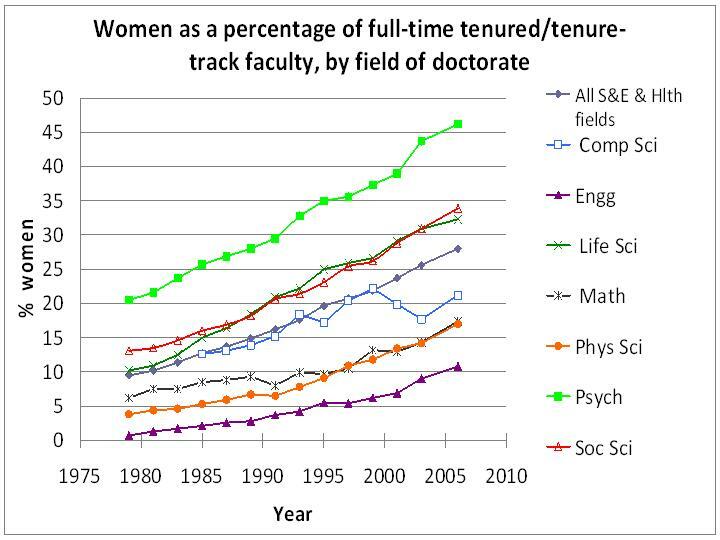 There is a substantial drop-off in the percentage of women in tenured and tenure-track faculty positions from these available pools. 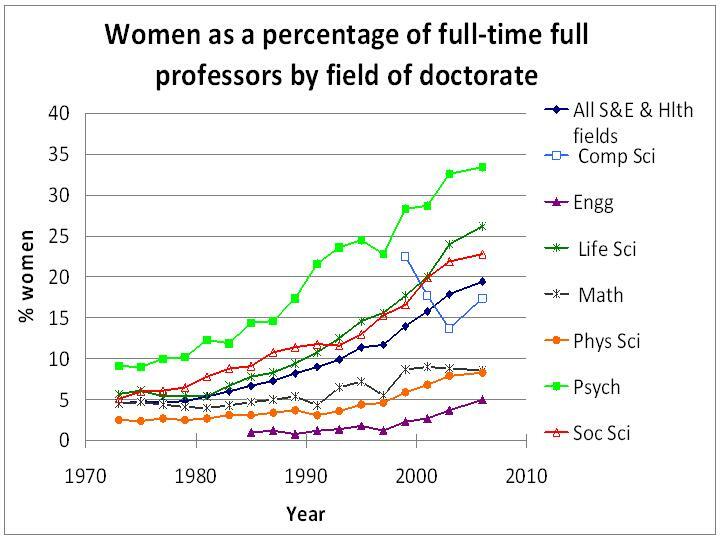 Some of the reasons for this gap between fractions of Ph.D. degrees received and fractions in academic faculty have been put forward in Virginia Valian's book Why So Slow: The Advancement of Women. She provides empirical evidence and a theoretical framework in which to think about it. (See also the video of her talk at MIT.) 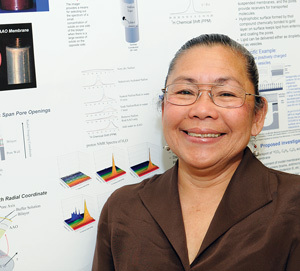 Recommendations for effective practices for recruiting women scientists and engineers to faculty positions and retaining them in these positions have been reported in the The National Academies Beyond Bias and Barriers: Fulfilling the Potential of Women in Academic Science and Engineering. See the Bibliography of Gender Issues in Academe and WISE news for more about this subject. What can institutions do about this gap? It is important to provide materials for training of search committees, executive committees and promotion and tenure committees to be sensitive to unconscious bias in the recruiting, hiring, retention, promotion and tenure process. Some of the materials which I have prepared and used in educational workshops for the committee members who are the evaluators in these processes, for diversity and bias awareness are available here. This website is dedicated to STEM women who are interested in an academic career and contains some of the materials which I have prepared for career development of women in STEM.